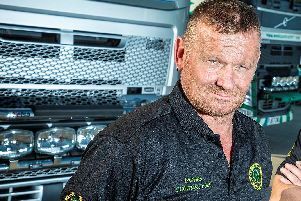 A groundworker caught more than twice the drink-drive limit was going to the aid of his dad who had fallen, a court heard. Burnley magistrates were told how Kyl Flannery (27) had been followed by police in Padiham. He then went down an alley. Flannery gave a positive roadside breath test and at the police station blew 88 microgrammes of alcohol in 100 millilitres of breath. The legal limit is 35. Mr Glen Smith (defending) told the hearing on Sundays Flannery would go to a friend's house and would leave the car. He received a text message from his father to say he had fallen at home and couldn't get hold of the defendant's mother. He said he was going to hospital in an ambulance. The solicitor said Flannery's father had a number of significant health issues, had recently suffered from cancer and had mobility issues. Mr Smith said: "It was going to take 10 to 15 minutes for the defendant to walk and he couldn't get a taxi. He saw the police car and he accepts he panicked." Flannery, of Lancaster Drive, Padiham, admitted driving with excess alcohol on October 28th. The defendant, who had no previous convictions, was banned for 22 months and was told to pay £235 in fines, costs and victim surcharge.